Deep in a tropical forest in Borneo 15 years ago, Rutgers student Didik Prasetyo first encountered a young male orangutan that he named "Jerry." The great ape was one of several orangutans that Prasetyo and other researchers followed at the Tuanan Orangutan Research Station in the Mawas Conservation Area in Indonesia. Prasetyo was skeptical when colleagues said orangutans always remember faces. But five years later, he spotted Jerry again in the same forest and the primate recognized him. "Orangutans are very smart," said Prasetyo, a doctoral student in the Graduate Program in Ecology and Evolution in the School of Environmental and Biological Sciences at Rutgers University-New Brunswick. "Slowly, he came closer to me until we were about 6 feet apart. After that, I thought, 'OK, we're friends,' and I kept following him without a problem." Prasetyo's passion is learning more about the endangered apes and trying to conserve their habitats and populations, which face enormous pressure from deforestation from logging, palm oil and paper pulp production and hunting. He co-authored an alarming recent study in Current Biology on the estimated loss of more than 100,000 Bornean orangutans between 1999 and 2015. "To prevent further decline and continued local extinctions of orangutans, humanity must act now," the study states. "Biodiversity conservation … must become a guiding principle in the public discourse and in political decision-making processes." "Orangutans can adapt to different situations," Prasetyo said. "When the forest changes from primary (old growth) to secondary (regenerated), they can adapt. Why not protect them in that forest and they can survive? We just need to make sure there's no hunting." Prasetyo's interest in conservation began when was growing up on a small family farm in Nganjuk, near Mount Wilis in East Java, Indonesia. "People were always removing the top of mountains or opening the forest to agriculture," he said. That inspired him to pursue a bachelor's degree in biology, focusing on ecology and conservation, at Universitas Nasional, Jakarta, which he earned in 1998. He received a master's degree in conservation biology from the University of Indonesia in 2007 and began his doctoral studies at Rutgers in 2013 under the supervision of Erin R. Vogel, a faculty member of the Graduate Program in Ecology and Evolution and an associate professor in the Department of Anthropology and Center for Human Evolutionary Studies. "Didik has been in the forefront of a lot of the orangutan conservation efforts in Indonesia," Vogel said. "He's been very involved on the ground in many surveys that led to these recent population estimates. If he's not already, he will be one of the future leaders of orangutan conservation." Prasetyo became interested in the apes when he mapped the genome of orangutans in East Kalimantan in eastern Borneo, Indonesia. Orangutans weigh about 90 to 180 pounds and are quite shy. They're the most solitary of the great apes and they live about 45 years in the wild. They spend nearly all their time in trees, but Borneo orangutans also spend time on the ground, according to Prasetyo. His research has included the nesting behavior of wild orangutans. Every night, they build strong nests, or beds, in trees, with branches they lock together. They also make blankets using big leaves and pillows from small branches with leaves. In the rainy season, they make better blankets that double as umbrellas. 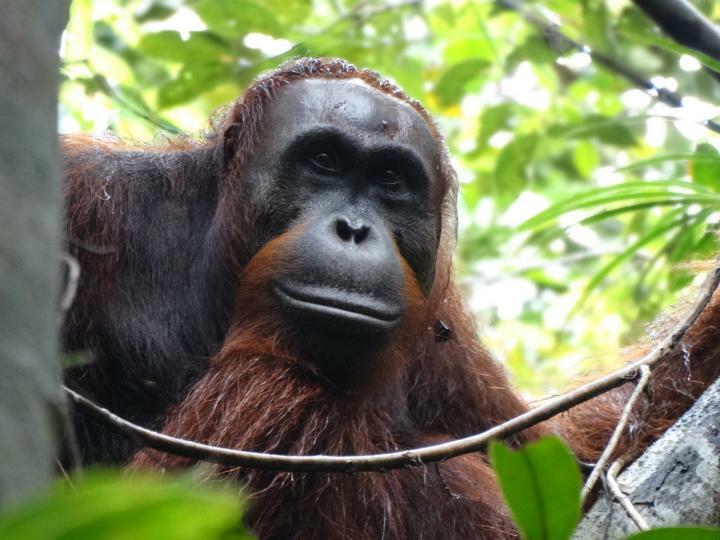 Prasetyo's doctoral research focuses on the development of flanges – the large facial disks, or cheek pads, composed largely of muscle and fat that surround their faces – in male orangutans, touting their social status to attract females. Males will also develop a large, muscle-covered throat patch and long hair, and double their body mass, according to Vogel. But scientists know very little about bimaturism in adult male orangutans, and why flange development is delayed in some of them. "Flanged orangutans put on a ton of fat and muscle, they look very different and they start acting very differently in the forest," Vogel said. "They give really amazing long-call vocalizations that travel as far as a kilometer. They tend to attract females to them." Prasetyo is trying to gain a better understanding of what triggers the transition of adult males from unflanged to flanged and why some males delay their transition. He's studying the diet of captive orangutans, competition among males and the hormones testosterone and cortisol, which is released during stress and inhibits testosterone production and may delay flange development. Long-term studies show males eventually become flanged, but scientists are not 100 percent sure, Vogel said. "Didik is a great student, a really hard worker and a great collaborator," she said. "I feel like when he's done with his Ph.D., he will be an excellent professor in Indonesia and will one of my collaborators in all my research efforts in Indonesia."